I am thirty-one-years-old and I have been depressed for at least 14 years or more. I have struggled with insecurities, low self esteem, perfectionism, fear, and anger all of my life. A therapist once described my family life as a “toxic cesspool” and concluded that my depression is really like post traumatic stress disorder. In 1997, I decided to run away during my freshman year at Duke. I told my Resident Advisor that I couldn’t handle life anymore and then promptly walked out the front door of my dorm. I returned an hour later, having never made it off of East Campus. But I did walk its perimeter – on the inside of the “wall.” I continued to suffer from these deep bouts of depression throughout the rest of my time at Duke, but in my senior year, I began to experience frequent and severe headaches. And at the age of 21, I found out why I was having those severe headaches. I was diagnosed with hypertension, better known as high blood pressure. Although my physical condition was diagnosed, I was not ready or able to accept that I suffered from depression, but I knew I needed help. I wouldn’t talk to my family because they were a significant cause of the problem, and I didn’t talk to my friends because I feared no one would understand. I considered going to Counseling and Psychological Services (CAPS) at Duke, but I was afraid, afraid of being labeled or judged. I suffered in silence instead, and convinced myself that I could “fix” myself. Graduate school made things worse. Living in a new city and attending a new school, I was even more isolated than before and felt the realness of my insecurities as an Ivy League doctoral student. Despite being recruited and offered a full tuition fellowship, I seriously doubted my competence and potential to excel academically. I either slept constantly or not all. I stopped doing my assignments. Then I skipped a class here and there. I cried quite a bit. My eating habits were atrocious. I didn’t know how to deal with my anger, my sadness, my confusion, or my loneliness. I was drowning emotionally. I reached out to the university Chaplain – we only met for a few sessions, but it was great to talk to someone and admit that I needed help. I even hopped on a plane and flew to Georgia to spend the weekend with the author (and his family) of a book that many would file as “self-help” or “psychotherapy.” While in graduate school, I decided to give CAPS a try because CAPS was discretely located within a building that housed several other services. This way, if anyone saw me going into the building they wouldn’t automatically assume that I was going to counseling. I quit after a handful of sessions. Then I quit my doctoral program and abandoned my full tuition fellowship. I left the University of Pennsylvania in good standing, with an approved leave of absence. A year later, I officially withdrew. I then became a teacher in a private school and moved back in with my parents, which was the absolute WRONG thing for me to do. I was miserable. It didn’t take long for me to seek out Caroline, the Chaplain at the school where I taught. My conversations with her were like taking deep breaths in my stifling world. We spoke often, and I cried often. I left teaching after one year, and consequently lost my connection with Caroline. Over the next several years, I tried to find relief in church, books, men, sleep, food, and work. Things became worse for me, and I was ready to give up. I began having thoughts of dying, believing that I, and the world, would be much better off if I simply weren’t around anymore. I would finally have peace. In 2007, I began seeing yet another counselor. Those sessions were helpful, but after 8 or 9 sessions, I quit. I was depressed – but I was in denial. I quickly spiraled downhill over the past six to nine months, approaching my rock bottom. Depression was taking a toll on my physical, emotional, spiritual and mental self. I was constantly fatigued, my high blood pressure remained, I developed severe and frequent migraines, my hair was beginning to gray at a faster rate, I slept often or couldn’t sleep at all, and I was ready to give up. I began seeing Sue, yet another counselor, in October and for whatever reason, I’ve stuck with her. Sue suggested that I consider antidepressants. I knew I was depressed, but I resisted. I resisted because taking antidepressants would mean I’d have to admit that I was depressed and I feared that my life was truly out of my control. Despite that belief, I talked to my primary care physician and asked for a prescription in December. I finally began taking the antidepressants in mid-February and saw a marked positive difference in my mood. One month later, however, I had an emotional breakdown. My family situation and my life in general seemed to simply shatter. I really began to feel numb to the world and didn’t care about anything at all. Having stuck with Sue all this time, she was a tremendous support for me. My family was a major part of the problem, so I was distanced from them. Without warning, I broke up with my boyfriend of 4 years, moved out of his house within 3 hours, and moved into my own apartment within 3 days. I continued with psychotherapy and antidepressants, but I was so extremely isolated and in a bad place. After these incidents, Sue asked me for the first time, “Are you thinking of hurting yourself?” I replied honestly, “no.” I wouldn’t have minded dying in a car accident –a frequent vision of mine – but I was not conjuring ways to cause it. Coming out of “hiding” was the beginning of my breakthrough. I was not judged, as I feared. I was loved and accepted and supported. As I pour out these words, I can honestly say that at this precise moment, I am experiencing a happiness and peacefulness that I’ve never felt before. I have a long road ahead of me, that’s for sure. But I’ve opened myself up to the love of my friends. This has been 14+ years in the making; therefore, no single decision or event suddenly transformed me. I’ve muddled through and fought through some of the saddest and darkest times of my life, and it has been worth it. I never quit. 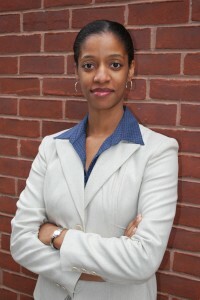 Samantha A. Murray, pictured above, is 31-years-old and lives in Baltimore, MD. She graduated from Duke University and earned a master’s degree in educational policy from the University of Pennsylvania. Samantha loves her “right now” dream job as a Research Specialist in the Baltimore County Public Schools, and she is also a women’s basketball official and a high school badminton coach. Her aspirations include establishing an education nonprofit organization to support vulnerable urban youth and their families and to elevate her basketball officiating career. Samantha, how are you moving on with your life? What do you do to stay focused on a daily basis? Well, “daily” is a key to your question. It is definitely a one-day-at-time process. It really was just after sending you guys that e-mail that I realized that I was not alone and that I didn’t have to walk this alone. I cried at every e-mail and text and phone call that I received. I went out with Brandi and Tina. And I was journaling like crazy – something that I failed to mention in my piece. I’ve been writing in a journal for more than a decade. I burned one, but I have at least 3 others. And I continue to write. That has helped me, despite the pain of re-reading some of what I’ve written, because I am able to see myself. And I have slowly but surely learned to be more compassionate with myself. I don’t beat that girl up – I just “listen” to her – if that makes sense. So, to get to your question, I really just have to constantly remind myself to be compassionate with myself. I remember that I have people in my life who see me and love me – and really, how can we really feel loved if we are in hiding? Instead of listening to other people (one of the root causes of my stress and depression), I decided that at 31 with 2 degrees and other accomplishments, that I know how to make decisions for myself. When I encounter someone or a situation that causes me to doubt my decision making, I quiety say to myself that that person/they can “kick rocks.” For some reason, that works most of the time. And I pray. Shalena, thanks again. You’re a blessing! Sam, your story has touched and will continue to touch so many women. And you are right, it is a daily process, a daily struggle to choose the better things in life like happiness, joy, love, and peace. I believe that God allowed you to go through this awfully long, dark season for a reason. You must liberate others by sharing your story and letting them know that they are not alone and that they can lead healthy, positive lives–and most of all, love themselves! Samantha’s (and Carla’s) story is not as isolated as many may want to believe. Depression is much more common than our society and the media of our country projects. In fact, I would venture to say that all of us have felt down at some point in our lives. That down feeling for many of us (including me) lasted for so long or was so severe that had we had been brave enough or bold enough to seek professional help, then we too may have been diagnosed with clinical depression. Many thanks to Samantha for raising her pen and her voice and for “coming out of hiding”. Thanks also to Shalena for the platform and the vehicle for awareness and change. Quiana, you, too can share your personal story. Be blessed! Sam, I decided to post a comment to let you know that you’re not alone. Lifelong depression ended my Duke career early and a host of other past and present setbacks that I, even as a journalist, don’t have the stomach to write about. Maybe I never will, who knows. I’ve spent a lot of time hiding that major part of my life from the world including friends and family. Anyways, again, just wanted you to know you’re not alone. Wish you the best. Carla, I never knew this about you. Thank you for opening up here. I’m so glad that you reached out to Sam! Hopefully, you will write about your experience and liberate others. I love you! Talmeedah, thank you for your kind words! As I told Shalena, this was a very difficult task for me, but I knew that I should write about my experience. I’m glad I did. Thank you for sharing this story. I am so glad that you are in my life and hope that I can be as supportive of you as you have been of me. I thank God for the Sue in your life. No one ever told us how hard life would be, instead God provided angels to help us deal with each difficulty. I believe sometimes the angels show up as the “Sue” in our life or as a bit of sunshine on the darkest day. As a doctor, I know that the anti-depressants can work, just not alone. So glad that you are reaching out to friends, giving traditional medicine a fair shot and sharing through your God-given gift of writing. I love you, too!! Thank you. Sam, I absolutely love that you have gotten to a point where you can share with those of us who love you – and now the public. So many of us can learn from your experiences, and I am humbled to have you in my life. You and Melva need to stop making me cry! 🙂 I love you, too!! Samantha, you are so welcome. By the way, I had to laugh when I read one of your last comments and in it you say that negative folks can “kick rocks.” That’s an expression I use…a lot, lol. An oldie but oh-so-goodie. Can’t wait to read more of your writing. It doesn’t surprise me to read that you journal often. You are quite the gifted writer, girlfriend. Keep writing! I love that expression, haha! And thank you for your comments about my writing – it’s humbling to know that people enjoy my writing. I have to make myself write sometimes, but I’m encouraged. Thanks again! I love you, that’s it….. I also went to Duke (I recognized your name) and applaud you for sharing your story. Congratulations on your journey and on finding peace. In your story, I recognize a lot of myself and other Black women who have decided to pursue advanced degrees. Many of us have taken leaves of absence and/or quit our programs. I agree, it helps tremendously to share our experiences and to let each other know that we’re not alone. Too often we suffer in silence and probably extend our suffering unnecessarily. So thanks for sharing and I wish you the best in your journey ahead. Thank you for stopping by and reading Samantha’s story. I thank you for your honesty. I remember you from Duke. How have you been? I think you bring up a good point and I would love for someone to write about the pressures of black women pursuing advanced degrees. Why do many of them take leaves of absence. I welcome you to write about it if you’d like. Be sure to download the first chapter of my new upcoming ebook at https://www.shalenadiva.com/archives/2435. You’ll be so glad you did! Hi Samantha – It is so encouraging to hear your story as it is very similar to my own. Despite receiving offers to work at some of the top firms on Wall St., I struggled all the time with low confidence and worried about my own competence. I eventually did hit a bottom, and did take antidepressants as well as seek counseling. I have since left the industry, broken up with my boyfriend of 3.5 years and moved back home with my folks. Fortunately, my family situation is relatively helpful. I continue to struggle to keep my head up everyday in order to pursue my new career path (one which requires a fairly tough skin, and high self confidence). I like your advice of keeping a journal. I think it’ll be helpful to me. Thank you for stopping by Hillary. IT’s been a minute since I’ve seen you at Duke. I’m glad that Sam’s article helped you. I’m also glad that you sought the help you needed. I’m very proud of you. You go, girl! You have to keep us posted on your journey. Yes, I’ve been there before and I had my breakthrough in 2006 and haven’t been back since PRAISE GOD! Yup sure did and as i got older i realized what it was.. i thought it was a normal feeling , nobody ever taught me otherwise.. As a child your so resilient and adapt to situations ..i knew nothing more or less. Thank god i now know better! Yes…..I have been dealing with depression since I was 14…..
@All—I wonder why so many suffer in silence. What helped you all come out of it—what it medication? Counseling? Prayer? Depends on situations i guess. Mine was rough from the get but by the time i was idk like 15 i was sent to a foster home and then sent to an all year round Mormon school.. i felt abandoned and betrayed and as in my last post in the past on… your page my father had killed someone from drinking and driving and lost family; aunts and unlces on my dads side to drugs or death by illness all at once. My mother remarried and i had 2 evil step sisters who made me feel as if i was the ugly red headed step child.. So as a young girl i did alot of partying and knocked it out of my life early, trying to numb the pain i was feeling. It wasnt until i had a child that i didnt want alot of the same life style for my baby that i had! So it wasnt until alot of my actions and behavior was starting to make sense. I always wondered why i felt the way i did or had. But Honestly im not huge in to prayer but i do believe! @Chrissy—I would love to get your story, too. It sounds so intriguing. I’m glad that you made it out alright. I think my life changed once my son was born, too. It gave me a new love and respect for life. I want to hear more about your experience. I couldn’t take the way I was feeling anymore I went to see a therapist she reccomended that I be medicated and I refused it. She continued to help me though. My husband was also there to help although I nearly drove him crazy he hung in there. ‎@Joice….I’m still in therapy and I take meds…..and as u see from my page….I’m in constant prayer….and now that I know my family history(both sides) have a history of mental illness…. E I just couldn’t do the meds I still see her but she knows how I feel about that. I stay prayed up as well.Both sides of my family have mental illness also. I just can’t do the meds. that’s just me. I deal with it. I got dignosed as being majorly depressed and its been all my life. I just take min by min. I been hiding it but have been called crazy alot b cause I didnt understand what was going on. I take flower essence drops Bach Flower Essence Rescue Remedy I was on medication but it was causing me to grind my teeth at night and wake up with a really bad headache. Natural product with no side effects. @Felicia—I think you, Karen and Elaine hit on a major point. Many people are simply afraid to talk about it and don’t think it’s that big of a deal. I’m so glad you found something that helps you. I need to know more about this. ‎@Felicia….I’m glad u found something that works…..and if meds help u to be and feel better do that too…..Herbal remedies r good for some people…make sure u do ur on research as well….if u have heart problems such as high blood pressure….some herbal remedies will do more harm than good…. @Tonja—WOW! What a testimony. I want your story, too. In fact, I want all of these stories because we need to read them. I want to do a conference call with you all so we can share and then I can show you guys how to write about your experiences. Do you guys want to do that? Let me know. We soooo need to do this. Thanks for the love, Tonja! God heals and restores and I am a living testimony to that. To God be the glory. Yes there is a story here. God will allow me to write it. I use my life to encourage others and let themk now God hears your cry even from childhood and He is a faithjful, prayer answering God.